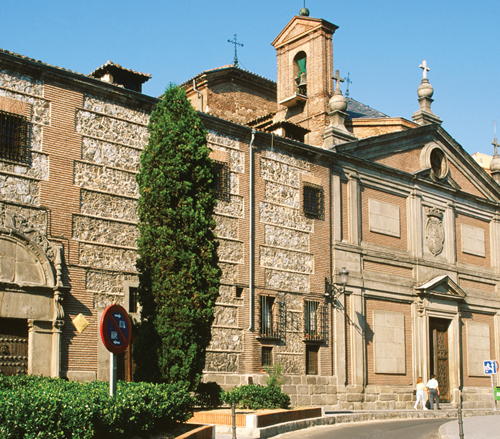 This award-winning museum is also a working convent – a haven of peace and quiet after the noise and bustle of Puerta del Sol and the Gran Vía nearby. The building started out as a palace, owned by the royal treasurer, Alonso Gutiérrez, but in 1555 he sold it to the sister of Felipe II, Juana of Austria, who founded the convent four years later. The nuns were Franciscans, but became known, because of their aristocratic backgrounds, as the “Barefoot Royals”. The convent is crammed with works of art – paintings, frescoes, sculptures, tapestries, tiles, woodcarvings, embroidered vestments, liturgical gold and silverware – donated by the nuns’ wealthy relatives. The church (rarely open to the public) contains the tomb of Juana of Austria. Today the convent is famous for its artistic treasures, but in the 16th century it was equally renowned for its music. This was largely due to the reputation of Tomás Luis de Victoria, chaplain to the Empress María from 1586 to his death in 1611. Born in Avila, Victoria studied music in Rome, but his output is infused with a mysticism more typical of the Spanish Counter Reformation. Victoria’s religious music was among the first to be heard in the New World. The guides ask visitors to wait in the foyer until there are enough people to make up a tour so allow for a delay of up to 15 minutes. While all the tours are in Spanish only, questions in English are welcomed. Nothing prepares visitors for this extraordinary sight. The Grand Staircase belongs to the original palace, but the dazzling frescoes and trompel’oeil, covering walls, arches and balustrades, were added in the 17th century. As you climb the staircase, look right and you’ll see another trompel’oeil feature. On the “balcony” are Felipe IV and his family – Mariana of Austria, the Infanta Margarita Teresa and the Prince of Asturias, Felipe Próspero. The prince dates the painting by Antonio Pereda, as he died, aged four, in 1661. The 68 panels by Sebastián Herrera Barnuevo feature matriarchs of the Old Testament. The Virgin of Guadalupe painting is a 16th-century replacement. The magnificent collection of tapestries, on display in the former nuns’ dormitories, were made in Brussels in the 17th century. The 10 panels on view represent the Triumph of the Eucharist. The tiny chapels surrounding the cloister were rooms of the original palace. Outstanding among the 16th and 17th century works of art is a wooden polychrome Recumbent Christ by Gaspar Becerra. Visitors enter through an intricately carved Plateresque doorway. Among the paintings lining the walls of the three chapels is a beautiful Virgin and Child from the late 15th century – one of the oldest works of art in the convent. By tradition, when a nun died her body was placed on the tiled bier, while prayers were said under the light of a large lamp (candil). The royal portraits include two of Felipe II’s children and Juana of Austria, both by the 17th-century artist Alonso Sánchez Coello. 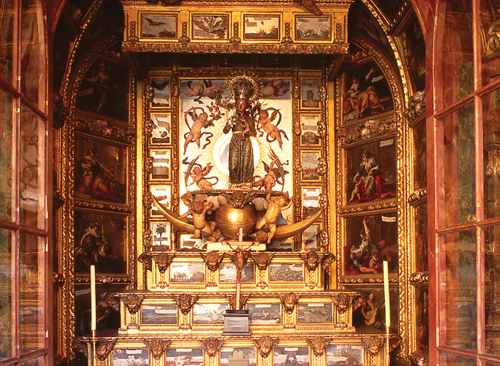 The choir contains the tombs of Empress María of Austria (sister of Juana) and the Infanta Margarita. One portrait over the entrance is known as the “abandoned girlfriend” – the sitter, María of Portugal, was betrothed to Felipe II but he married Mary Tudor of England instead. The highlight here is a series of 16th-century frescoes depicting the life of St Francis of Assisi. Look out for two devotional works by Pedro de Mena: Ecce Homo and La Dolorosa. This portrait gallery was once used by members of the royal family as a retreat.